On that early morning in May when news about Master's tour through Europe reached local initiates, (not only to Europe but specifically to Scandinavia), a panic - like enthusiasm and joy exploded among us, for our deepest wish had become true. Although it was the first time for us to arrange all the practical details of a visit by Master within such a short frame of time, things started rolling well after the first few days' chaos. Everyone contributed in his or her own best way and in times of challenge we would meditate, and the answer was there. Yet without the slightest doubt, the biggest help we received was from the incredibly efficient and professional visiting working teams from many other countries. Their experience, practical example, selfless devotion and guidance built a foundation for it all. 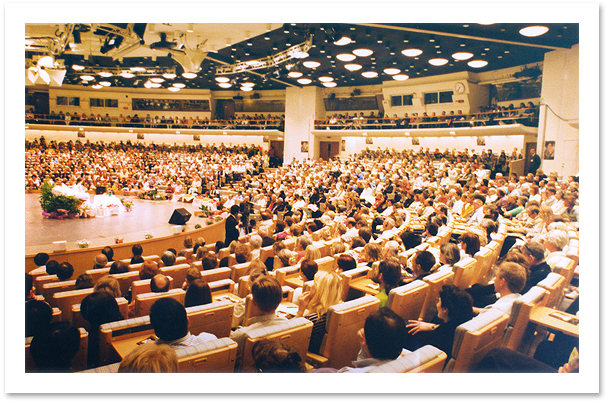 The location of the lecture was City Conference Hall in the center of Stockholm, with its large courtyard and rainbow-colored fountain outside. After much preparation, the scheduled lecture date of May 31 finally arrived. The weather was wonderful with a clear blue sky, and at night there was a full moon. At 6:00 PM the lecture hall started filling up, and by starting time the hall was full to capacity. More than 1200 people sat silently, while the air was filled with the sweet fragrance of flowers and a highly positive vibration. 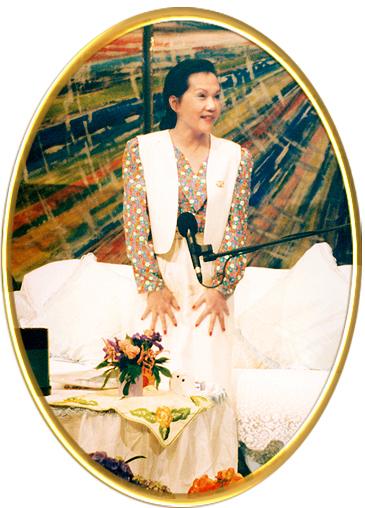 Then She appeared - our much-loved Supreme Master, dressed in light colors, like an innocent spring flower. The applause generated at that moment was warm and intense. Relaxed, genuinely present, simple and beautiful, Master had such a grace around Her. In a sweet voice She talked to us, and every word was like a dewdrop of divine nectar, waking up the God consciousness in the context of our ordinary lives. Many people at the lecture seemed to have known Master for a long time, having followed the five precepts naturally, and were now ready to receive initiation. There was a lovely buzzing sound around the initiation booths both before and after Master's loving lecture. This marvelous evening ended after midnight and we initiates understood that our small lake of practitioners was now expanding into the big ocean of the Quan Yin family. So it was time to expand our Center. At the end of the evening a surprising message was given by Master: She would stay for another day for the next day's group meditation, and a new opportunity for initiation was given to those who missed it the first time. The next day, Master surprised us again with Her overflowing Love. During the light meditation She came to each one of us and blessed us. Many of the initiates cried out of sheer joy and a sense of connectedness. It felt like a crystal within our hearts had been hidden under piles of dust, and suddenly it was out, open and alive again!